The venue for the second leg of the six-round, radio-controlled 1:12 scale LMP12 British Championship season is the gym hall at Lord Lawson of Beamish Academy, near Newcastle. Hospitality is a broken vending machine and Bernie Ecclestone is a slightly younger chap called Peter Winton with less hair but all of it his own. I can’t laugh, though, because many of the road cars I’ve just parked my old nail among on arrival are serious pieces of kit, including a 65-reg BMW X5 M50d, a 17-reg Golf R and a 67-reg Mercedes-AMG C63. Unlike me, these guys aren’t here on a tight budget. What they are here for is to race. That much is clear in the ‘garage’ (the Academy’s games hall), where around 70 blokes (there are only one or two female racers) of all ages, but most of them in their thirties, occupy rows of tables piled high with voltmeters, soldering guns, electric screwdrivers, pliers, rolls of insulation tape, brightly coloured plastic car bodies and half-finished cans of Fanta. One chap is lovingly wiping his car’s plastic body with a bright yellow duster. Another is testing his car’s electrical connections with fierce concentration. 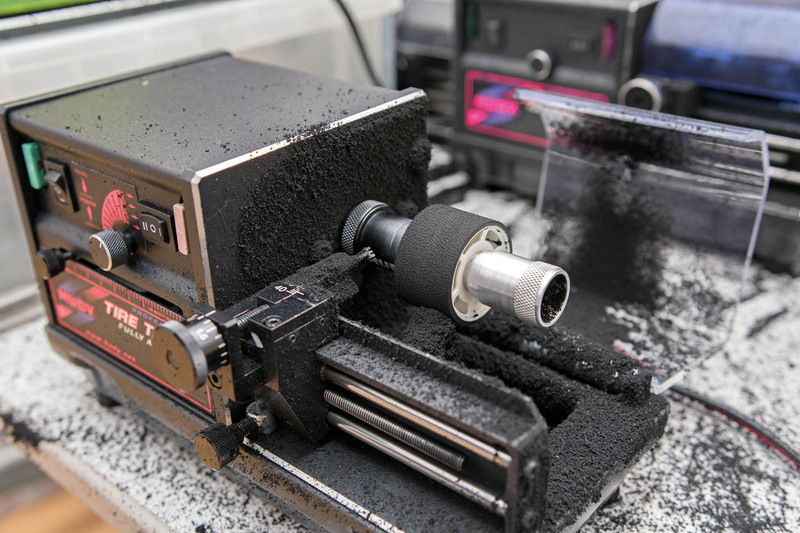 In the corner, a group of grown men are expertly turning small tyres on three miniature lathes, grinding down the rubber to reduce its thickness so the small electric racing cars slide more easily. Lewis Hamilton cut his teeth in radio-controlled car racing after his father, Anthony, gave him one when he was six years old. Hamilton came second in the BRCA national championship the following year. Surprisingly, the multi-millionaire Formula 1 champion has better things to do today than cheer on his erstwhile rivals. No matter, there’s ample compensation in no less a figure than 14-time European and five-time World LMP champion, Dave Spashett. He’s been racing for 36 years – almost since the LMP class, one of the oldest RC racing classes in existence, started in 1976, in fact. He cuts a modest figure. 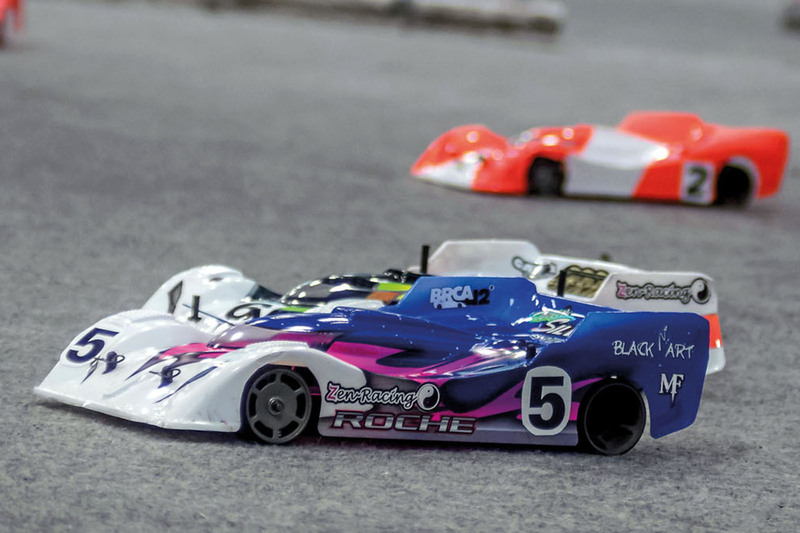 This level of remote control might sound far-fetched but the cars Spashett and his fellow RC enthusiasts are racing today are the most advanced electric models on the planet. Features include regenerative braking, a programmable EV motor whose frequency and timing can be varied across the rev range, heat sinks on the speed controller (effectively the ECU) and the motor to keep race temperatures down to 70deg C, and multi-adjustable suspension. They’re powered by lithium ion polymer batteries, such as you find in mobile phones and laptops. Just one is powerful enough to start a radio-controlled car. Many of the top EV engineers in the automotive industry served their apprenticeship designing advanced powertrains for RC racers. It’s been a brain drain for the sport, with one famous California-based supplier losing so many of its engineers to Tesla that it had to shut up shop. One racer here today whose day job must surely benefit from his passion for the sport is Mark Stiles. The multiple BRCA race winner is a mechanical design engineer at the Renault Sport F1 team, although by the time you read this he’ll have swapped overalls for Mercedes F1, home of his former race rival, the aforementioned Lewis Hamilton. Stiles’ passion for the sport began at school when he joined the radio- controlled car club. That fuelled an interest in automotive engineering that eventually led him to Oxford Brookes University, a degree in mechanical engineering and, since 2009, a career in F1. “Just like Formula 1, LMP12 is a very precise and technical class,” he says. “You’ve all the complexity of the powertrain but also of the suspension system. And just like F1, tyre selection and preparation are crucial. It’s quite warm today, which will help soften the tyres. Before each race, competitors can be seen applying an approved chemical to the rubber to accelerate the process. However, unlike F1, no one circuit is ever the same, meaning those who raced at Lord Lawson of Beamish Academy last year can’t claim an advantage this season. Anyway, it’s time I had a go, but first my car must pass scrutineering. Maximum permitted battery voltage is 4.209V, maximum weight is 730g and ride height must be no lower than 3mm. I’m good to go. The track is around two metres wide and has 11 corners. The quickest racers are lapping in around 11 seconds, so one corner every second. I join my five fellow ‘drivers’ on a couple of stacked benches affording a bird’s-eye view of the track. I grasp the controller in both hands: left toggle, power; right toggle, direction. The race director counts down and we’re off, me into the barrier but the rest of the pack clear into the distance. I reckon by the time a helpful steward has air-lifted my stricken racing car back into position, I’ve been lapped by the others at least once. This goes on until humiliation forces my retirement. It’s tricky, this RC racing thing. Keeping your thumbs on the toggles at all times and knowing your left from right (not easy since you have to constantly reorientate depending on whether the car is heading from or towards you) are key. But I can see its appeal and as the club tells me (and as Stiles proves), for a youngster keen on cars and engineering there’s the seed of a successful career here. There are 10,000 active racers and 220 clubs in the UK alone. 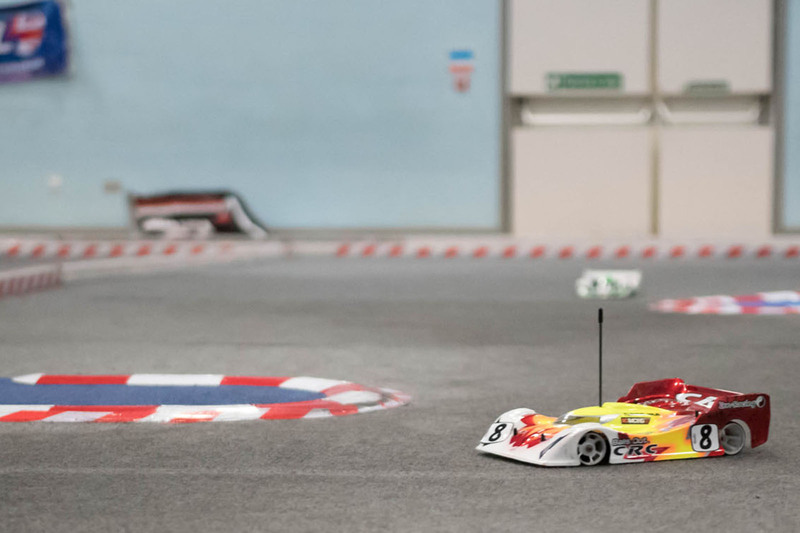 While venues like the Lord Lawson of Beamish Academy continue to hum to the sound of 50mph remote- controlled racers, the future of Britain’s automotive industry is in safe hands.